Chris Horner took a big step toward winning the overall at Tirreno-Adriatico on Sunday, finishing third at the Prati di Tivo ski station to defend his lead over Roman Kreuziger and Vincenzo Nibali. Horner (RadioShack-Nissan) made his return to racing at the one-week Italian stage race this week after a heavy crash at the Tour de France in July and resulting concussion and blood clot. RadioShack brass slotted the 40-year-old for the “Race of the Two Seas” at the last minute, citing a need for a GC threat. 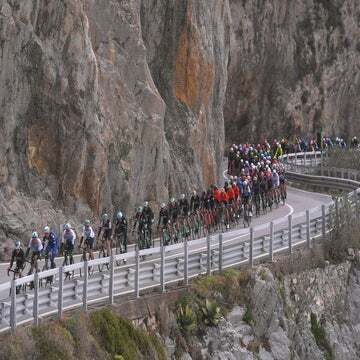 The move paid and with crafty riding high up on the finish climb in the Apennine mountains, Horner showed he is back. Horner arrived to the crux of the 14.5km climb in a group of 20-odd riders. Isolated from his RadioShack teammates, Horner fended off multiple attacks from Kreuziger’s Astana teammates and others by playing off the GC and stage interests of Nibali’s Liquigas mates and Astana. 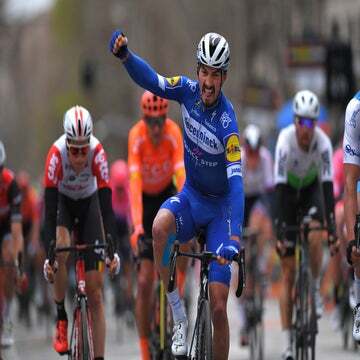 When Kreuziger finally surged with 3.9km remaining, Horner matched the pace and Nibali countered, almost immediately taking a 10-second advantage. The American patiently sat in the group until Nibali’s advantage grew to 30 seconds — four seconds shy of becoming the overall leader on the road. With 1.4km remaining and roadside snow building, Horner went to the front of the five-rider chase group and drove the Italian’s lead down to barely over 10 seconds. The difference at the line grew back to 16 seconds, but Horner had done his job. Kreuziger pipped the American for second and a two-second time bonus, but Horner will start the penultimate stage to Offida — with its somewhat technical, steep 6.5 finishing circuits — with a five-second advantage on Kreuziger and 12 seconds on Nibali. Horner is renowned for his ability to read a race. He showed why high up on Prati di Tivo today and will again need to be on his toes late in Monday’s stage if his vision for the final time trial is to play out.